The Pickathon Music Festival is a yearly, mid-sized event held on Pendarvis Farm in Oregon that focuses on indie folk and rock acts. 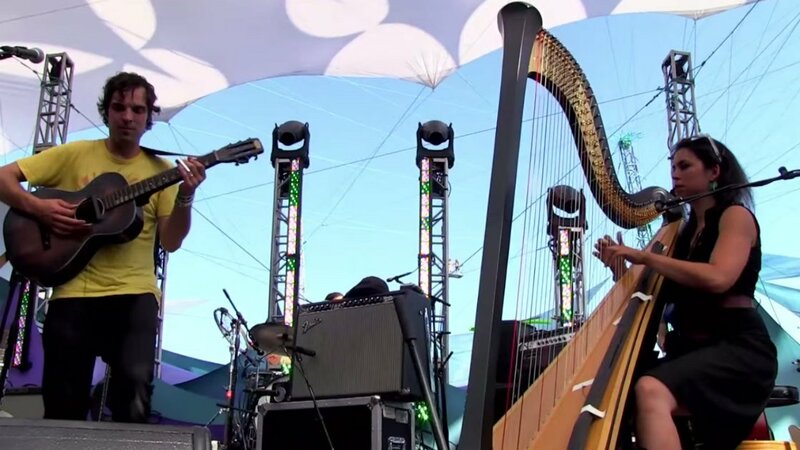 Yesterday, Pickathon uploaded a live performance of The Barr Brothers performing "Half Crazy" from last year's event. You can watch it above. If you've never seen a drummer use spokes on a bicycle rim as a percussion instrument, then you're in for a special treat as you watch the clip above. Drummer Andrew Barr keeps the song's rhythm flowing while brother Brad Barr lays down swampy guitar riffs. Harpist Sarah Page lends a classical touch to the rollicking song. The band clearly keeps the crowd engaged under the sunny skies with their style of folk rock. Also, be sure to check out the Barr Brothers' intimate backstage performances at Pickathon 2014 courtesy of KEXP. "Half Crazy" is included on the band's latest album, Sleeping Operator. You can get it on Amazon (CD , Vinyl , MP3 ). You can also stream the complete album and read our review here on Zumic. For The Barr Brothers' latest music, news, and tour dates, check out their Zumic artist page.